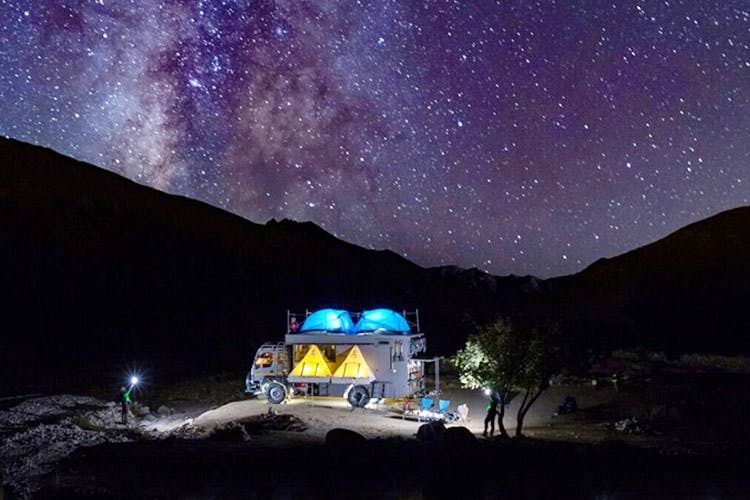 Green Dot Expeditions is a Chandigarh-based travel company that drives its overland truck across the span of India’s most undiscovered spots. The family-run Taurus now offers tours for a group of eight (plus the staff), and have different packages in the hills and deserts. Capt Suresh Sharma, an ex army person and a wildlife enthusiast, realised that the real way to travel wasn’t on business class tickets, or staying in boxy hotels. It was being as close to nature as possible. His wife and children agreed. And so, the idea of a fully-equipped truck came about and the family (his children, mainly) got down to designing it. They’ve taken good care to add beds, toilets, outdoor chairs, camping gear, a kitchen and even hammocks. If you’re the sort of person who’s fiercely protective of nature, doesn’t want to be rushed on a vacation, wants to stop on a whim to photograph a village fair, and can spend hours just looking at the river or walking around the hills, this is going to be the best travel decision you make. They currently offer trips to Ladakh, Himachal and Spiti in summer, and Rajasthan, Gujarat and across the coast in winter. For now, they’ve also got cycling tours, photography expeditions and a special astrophotography trip planned. While promising you the best outdoor experience ever, they also make sure they’re following the ‘environment first’ approach (Capt Suresh and his wife have been fierce, nature conservationists for over a decade). They don’t just make sure that they honor, enjoy and promote local tourism (with participation, photography and more) but also carry all their non-biodegradable trash right back to the city (so there’s no littering of serene spots). The per-person cost of trips starts at INR 12,500, but varies depending on the duration of the trip and the exact package. Their longest and most expensive trip will set you back by INR 65k. P.S. It’s the ultimate dream if you’re a photographer, nature lover, adventurer or an unstoppable stargazer.